The eye can be deceived as has been proven countless times here on the Strip in Las Vegas: home to some of the world’s most famous illusionists and magicians. Perhaps it was an illusion that Terry Fator’s tummy and his former wife and stage assistant Taylor Makakoa’s top had grown exponentially since their marriage in 2010. Marital bliss can do that. Now that the marriage has been dissolved (Makakoa remains as a business partner and stage assistant), Fator has expanded not upon his physique but upon his faithful foam-molded family with the addition of Rusty The Robot, a totally “square” tin-can prototype robot designed to do the jobs of all employees at the Mirage Hotel. 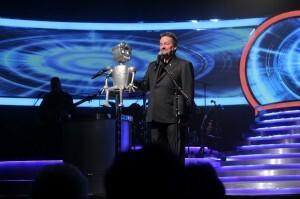 Rusty The Robot made his debut toward the end of Fator’s sixth anniversary show at the Mirage, Monday, February 16, before a packed and appreciative audience. Although I certainly have no degree in psychology, there most certainly was something Freudian going on in the theater from the get-go. Fator opened the show singing solo the nostalgic and bittersweet “Just A Gigolo”: a song that was first published by German composer Wiener Boheme Verlag in 1929 and later became a Billboard blockbuster for David Lee Roth in the 1980s. Having seen Terry Fator: The VOICE of Entertainment three times, I am consistently amazed and entertained by the man’s unique talent. Fator moves flawlessly from puppet to puppet; Winston the Impersonating Turtle, Vikki “The Cougar,” country legend Walter T. Airdale, Duggie Scott Walker, Julius, Emma Taylor, the world’s greatest Elvis impersonator Maynard Tompkins and Wrex the Crash Test Dummy, while performing songs by Cher, Taylor Swift, Lady Gaga, Tony Bennet, Elvis, Bruno Mars, Aaron Neville, Louis Armstrong and others. Along with Fator, it seems the carved and crazy cast has matured over the years. The humor in the show was about five (not fifty) shades more adult this time around. And when Rusty The Robot hits the stage and flips his lid it’s apparent that sometimes two heads can be better than one: someone has been thinking inside the Freudian box. Within the past year Fator has been divorced; he’s released a new DVD (“Terry Fator: Live In Concert”), a CD (“It Starts Tonight”) and a series of children’s books. In 2013 Fator nipped at the heels of Jerry Seinfeld when he hit No. 2 on Forbes’ list of top-earning comics. Fator donates a significant amount of his earnings to various charities, and to American troops and their families along with the proceeds from his after-show kiosk sales. SHOWTIMES: Monday – Thursday, select Fridays and Saturdays at 7:30 p.m.
TICKETS: Tickets for Terry Fator: The VOICE of Entertainment start at $59.99, plus applicable taxes and fees. A “Most Valuable Package” (MVP) Experience is available for $149.99 per ticket, plus applicable taxes and fees. The MVP Experience includes premium seating, an autographed photo, a souvenir show program and a complimentary drink.